Now take a look at what have happened to the Argentine peso since these “brilliant” comments. I leave it to my readers to figure out whether del Pont made a massive policy mistake when she ordered Uncle Milty’s picture removed…. M. Venizelos, the Prime Minister of Greece, told the League of Nations today that Greece would be unable to balance her budget without suspending her debt payments abroad. He hoped the necessity for such suspension would be only temporary. I am going to Moscow in a couple of weeks. Going to Russia always inspires me to think about monetary policy in commodity exporting countries. I recently found what looks to be an interesting paper on monetary policy in commodity exporting countries – “Monetary Policy in an Economy Sick with Dutch Disease”. The paper is from 2007. In the paper the authors Kirill Sosunov and Oleg Zamulin present a DSGE model for the Russian economy. The model in many ways is similar to my own thinking of the Russian economy and I therefore think it would be interesting to update Zamulin and Sosunov’s work. It would for example be extremely interesting to simulate the 2008-9 shock in the model under different monetary policy rules and what rules would have done the least harm to the Russian economy. 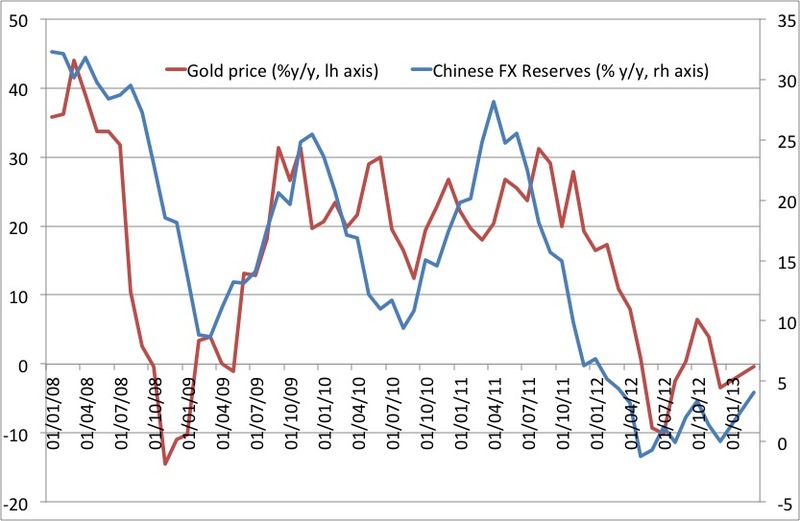 Would my suggestion that Russia should have followed an Export Price Norm for example have prevented the crisis? I have earlier claimed the sharp contraction in the Russian economy in 2008-9 was due to monetary policy failure. My feeling is that Zamulin and Sosunov’s model would yield a similar result, but I am not sure. Anyway, I hope to be able to do some work on that model myself – with the help of my colleague Jens Pedersen – in the coming weeks. Then we will see what we manage to get out of the model and I would of course encourage others out there with interest in DGSE model and particularly with interest in monetary policy in commodity exporting countries to have a look at the model for yourself (please drop me a mail if you are doing work on monetary policy in commodity exporting countries as well – lacsen@gmail.com). If we want to explain the Market Monetarist position on banking crisis then it would probably be that banking crisis primarily is a result of monetary policy, but also that moral hazard should be avoided and a strict ‘no bailout’ policy should be implemented. However, the fact that Market Monetarists now for example favour aggressive monetary easing in the euro zone, but at the same time are highly skeptical about bailouts of countries and banks might confuse some. I have noticed that there generally is a problem for a lot of people to differentiate between monetary easing and bailouts. Often when one argues for monetary easing the reply is “we should stop bailing out banks and countries and if we do it we will just create an even bigger bubble”. The problem here is that Market Monetarists certainly do not favour bailouts – we favour nominal stability. I think that at the core of the problem is that people have a very hard time figuring out what monetary policy is. Most people – including I believe most central bankers – think that credit policy is monetary policy. Just take the Federal Reserve’s attempt to distort relative prices in the financial markets in connection with QE2 or the ECB’s OMT program where the purpose is to support the price of government bonds in certain South European countries without increasing the euro zone money base. Hence, the primary purpose of these policies is not to increase nominal GDP or stabilise NGDP growth, but rather to change market prices. That is not monetary policy. That is credit policy and worse – it is in fact bailouts. As the ECB’s OMT and Fed’s QE2 to a large extent have been focused on changing relative prices in the financial markets they can rightly be – and should be – criticized for leading to moral hazard. When the ECB artificially keeps for example Spanish government bond yields from increasing above a certain level then the ECB clearly is encouraging excessive risk taking. Spanish bond yields have been rising during the Great Recession because investors rightly have been fearing a Spanish government default. This is an entirely rational reaction by investors to a sharp deterioration of the outlook for the Spanish economy. Obviously if the ECB curb the rise in Spanish bond yields the ECB are telling investors to disregard these credit risks. This clearly is moral hazard. The problem here is that a monetary authority – the ECB – is engaged in something that is not monetary policy, but people will not surprisingly think of what a central bank do as monetary policy, but the ECB’s attempts to distort relative prices in the financial markets have very little to do with monetary policy as it do not lead to a change in the money base or to a change in the expectation for future changes in the money base. That is not to say that the ECB’s credit policies do not have monetary impact. They likely have. Hence, it is clear that the so-called OMT has reduced financial distress in the euro zone, which likely have increased the money-multiplier and money-velocity in the euro zone, but it has also (significantly?) increased moral hazard problems. So the paradox here is that the ECB really has done very little to ease monetary policy, but a lot to increase moral hazard problems. Unfortunately many of those policy makers who rightly are very fearful of moral hazard – normally Northern European policy makers – fail to realise the difference between monetary policy and credit policy. German, Finnish and Dutch policy makers are right in opposing a credit based bailout of South European “sinners”, but they are equally wrong in opposing an monetary expansion. The paradox here is that Northern European policy markets by opposing monetary easing in the euro zone actually are increasing the problem with moral hazard and bailouts. Hence, when monetary policy is too tight nominal GDP (and likely also real GDP) collapses. As a result debt ratios increase – and this goes for both private and public debt. 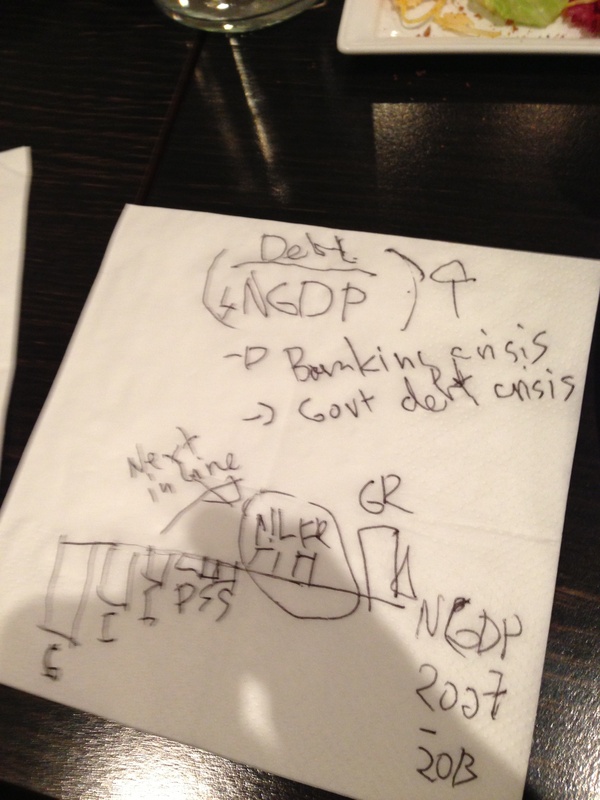 That will cause both sovereign debt crisis and banking crisis, which is perceived to threaten the future of the euro. The threat to the future of the euro so far has convinced Northern European policy makers to going along with bailouts and implicit and explicit guarantees to banks and countries around the euro zone. Hence, the ECB’s overly tight monetary policy likely have INCREASED moral hazard problems. Europe needs to return to a system where insolvent banks and countries are allowed to default. We need to end the bailouts. The Northern Europeans are completely right about that. However, we also need to end the deflationary policies of the ECB, which greatly increases public debt and banking problems. It is certainly not given that even if the ECB brought the NGDP level back to the pre-crisis trend everything would be fine. I am fairly convinced that the removal of implicit and explicit guarantees would force banks and countries to deleverage further. Moral hazard problems and bailouts have led to excessive risk taking. There is no doubt about that, but if the ECB (and the Fed!) focuses on maintaining nominal stability we can get an orderly return to a market based financial system where credit risks are correctly priced. And finally solvency problems should not be dealt with through monetary or credit policy. If a country is insolvent then the only answer is an orderly debt restructuring. Similarly if banks are insolvent orderly bank resolution is needed. Monetary policy at the same time should ensure that bank resolution and debt restructuring do not lead to a negative shock to monetary conditions. The best way to do that is to keep NGDP on track. Update: This is a greeting to the University of Chicago Monetary Policy Reading Group. This week the group is reading and discussing Ben Bernanke’s classic 1983 paper “Nonmonetary Effects of the Financial Crisis in the Propagation of the Great Depression”. In this paper Bernanke discusses his creditist view of the Great Depression. I believe that these views are what led the Bernanke Fed to initially response to the Great Depression with credit policies (trying to “fix” the banks) rather than through a focused increase in the money base and the money supply. My challenge to the UoC Monetary Policy Reading Group they should discuss how Fed policy has evolved from initially to be strongly focused on credit policies (QE2) to moving towards a monetary expansion (the Bernanke-Evans rule) and comparing the Bank of Japan’s new policy which is much more focused on an expansion of the money base rather than an attempt to distort relative prices in the financial markets. This is Friedman versus Bernanke. Charles Calomiris undoubtedly is one of the leading experts on banking crisis in the world. Calomiris has a new book coming out – co-authored with Stephen Haber. The main thesis in the book – “Fragile by Design: Banking Crises, Scarce Credit,and Political Bargains” – is that banking crisis is not an inherent characteristic of a free-market financial system, but rather the outcome of what Calomiris and Haber terms the “Game of Bank Bargains” between the government and special interests and how this game lead to different incentives for excessive risk taking or not. For natural reasons I have not read the book yet, but in a couple of recent papers and presentations by Calomiris and Haber have spelled out the main ideas of the book (See for example here, here, here and here). I find their large survey of history of banking crisis tremendously interesting and I find it particularly interesting that Calomiris and Haber conclude that the root cause of banking crisis has to be found in what political institutions different countries have. Said in another way the main cause banking crisis is one of “political design”. One of the main views of Calomiris and Haber is that some countries are a lot more prone to banking crisis than other. Calomiris and Haber list the following countries as particularly prone to banking crisis: Argentina, the Democratic Republic of the Congo, Chad, the Central African Republic, Cameroon, Guinea, Kenya, the Philippines, Nicaragua, Brazil, Bolivia, Costa Rica, Thailand, Mexico, Ecuador, Colombia, Uruguay, Chile, Turkey, Spain, Sweden and the United States. Similarly Calomiris and Haber list a number of countries that in general have been crisis free (despite abundant credit): Bahamas, Malta, Cyprus, Brunei, Singapore, Hong Kong, Macao, South Africa, Italy, Austria, New Zealand, Australia, and Canada. The differences between USA and Canada seem to be particularly interesting (discussed in Chapter six of the book). Hence, since 1840 the US have had 14 banking crisis, while Canada have had none and this despite of the fact that credit have been as abundant in Canada as in the US. While the two countries have the a very similar cultural and colonial history the political institutions in Canada and the USA are very different. These differences in political institutions according to Calomiris and the US have lead to the development of vastly different banking systems in the two countries – “branch banking” in Canada and “unit banking” in the US. There are a lot more in the book than what I have discussed above and the papers that Haber and Calomiris already have put out are extremely interesting and insightful so I can’t wait to read the book! The book unfortunately is not available on Amazon yet so I haven’t ordered it yet, but I hope that that will soon change. PS If there is one thing that seems to be missing in Calomiris and Haber’s discussion of the causes of banking crisis then it is a discussion of monetary policy regimes. That is unfortunate in my opinion as there is no doubt that monetary policy failure has played a huge role in the present crisis and in historical crises – something I know at least Calomiris acknowledges. Update: Charles Calomiris has informed me that “Fragile by Design” also include a discussion of monetary policy regime – for example in the case of Brazil. Update 2: Here is an recent interview with Charles on Bloomberg TV.